From 1992 – 1997, 62 children's horror fiction novellas by R.L. Stine were published selling over 350 million books world wide. The immensely popular series which would be hard to tackle with such short books has been made into a fictional biography where R.L. Stine writes books about monsters that become real if the original manuscript is opened. The screenplay by Darren Lemke was directed by Rob Letterman (Gulliver's Travels, Monsters vs. Aliens) into a 3D live-action/computer animated horror comedy. It has monsters galore, the story and situations are funny and nobody dies. Teenager Zach Cooper (Dylan Minnette) moves with his mom Gale (Amy Ryan) to Madison, Delaware where she has been hired as the new high school principal. They are welcomed to town by Gale's sister Lorraine (Jillian Bell who basically steals the movie). Next door he cute meets Hannah (Odeya Rush) who shows Zach this old fair grounds in the woods. 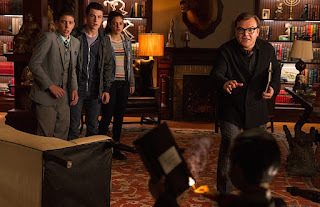 She's cryptic and adventurous, but her father (Jack Black) is very forbidding telling him to keep away. One night he hears a scream and runs over to check on her, even calling the cops. But the father makes everyone believe it was just the television. Zach knows what he saw and decides to break into the house when the father is gone with the help of his new friend from school, Champ (Ryan Lee), a dorky sort of kid. They discover the book shelf and Champ recognizes the titles of the infamous book series. No one knew what happened to the once prolific author. They are also curious why the books all have locks on them until Zach happens to unlock one of them, which has a Abominable Snowman as the monster. Unleashed, the creature causes havoc until the father comes back and saves them by trapping the creature back into the pages. They discover the father is R.L. Stein (not really a spoiler), who tells Hannah it's time to move again, that is until they discover another book has been opened. Slappy the Dummy, one of Stein's earliest and most dangerous characters decides to unleash all the books and destroy the pages so they can't be captured again. It's up to the kids and Stein to figure out how to put them back before they over run the town. There are ghosts, a giant praying mantis, deadly garden gnomes, aliens, spreading Venus fly traps, the undead, a gelatinous blob and a werewolf in sneakers and gym shorts. The cool thing about them is that they can't be destroyed because they reassemble again. Most of the town has been frozen by the aliens which hopefully will thaw. They have to get to the high school where the students are at a dance to get Stein's original typewriter in the plan to save the day. Millennials hoping for nostalgia may be a little disappointed with the modern day version of this universe. The movie starts with the typical Goosebump fashion with a young person moving to a new town. The rest of the movie is more like Night at the Museum sort of adventure where it could be dangerous, but it's not in the end. And like the formula for the books, the movie has a beginning, middle and a twisted end.